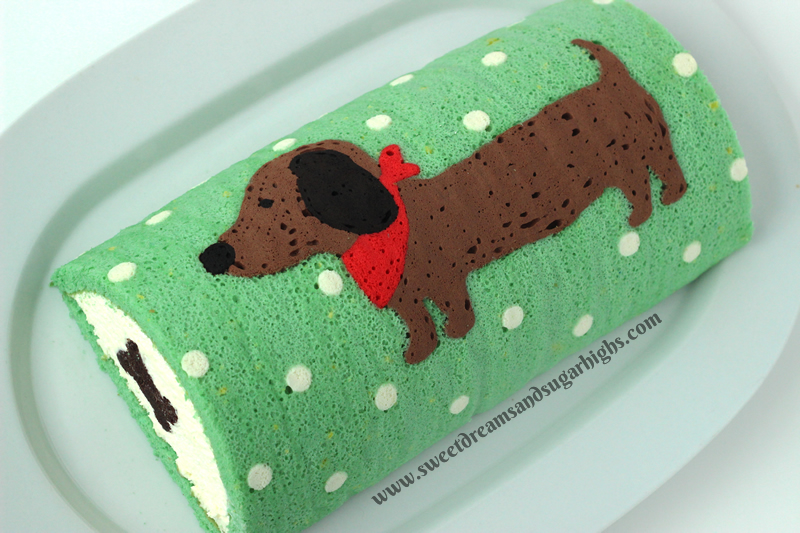 I’ve been seeing some really cute decorative Swiss rolls and rolled cakes floating around the internet lately so I wanted to experiment with creating my own. 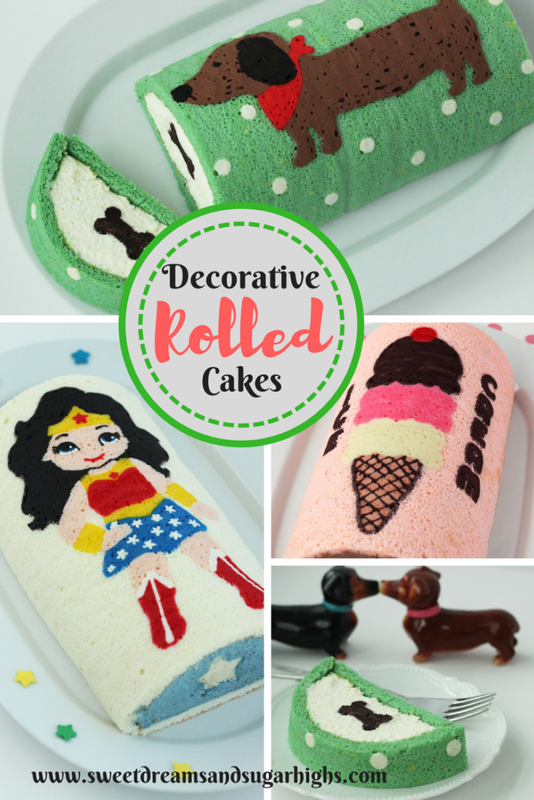 Three things I love are weiner dogs, Wonder Woman and ice cream so those seemed like the perfect patterns to use for creating my cakes. Two of the cakes I filled with mousse and pound cake cutouts and the ice cream cake I filled with homemade chocolate chip ice cream. And look how cute the mousse fillings look with the pound cake cutouts. 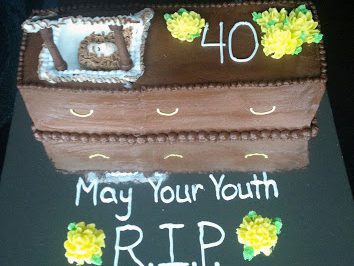 You really can use a variety of fillings though, as long as they firm up enough to support the shape of the cake. 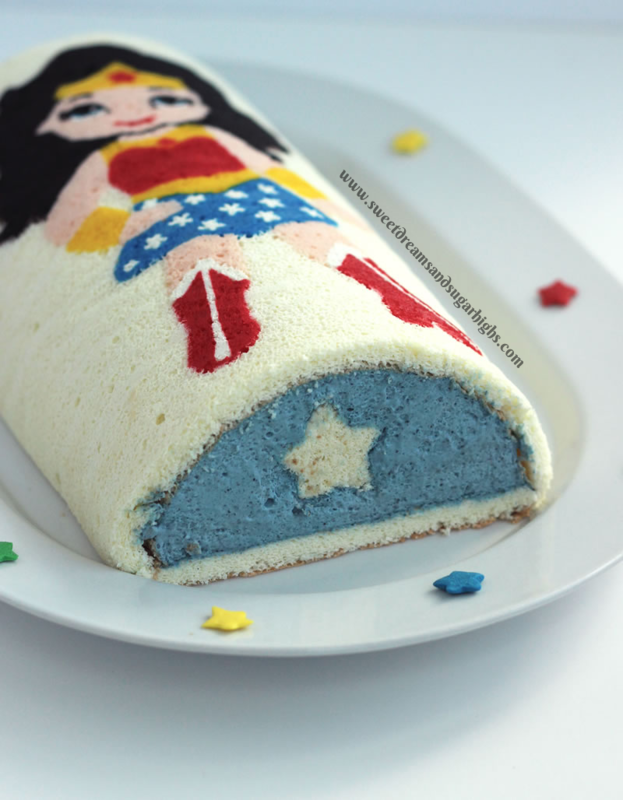 I used the white chocolate mousse recipe from my White Chocolate Mousse Cake for the Weiner Dog cake and this blueberry mousse recipe from Life, Love and Sugar for the Wonder Woman cake. I also loved the frozen version of the cake that I made by filling it with homemade chocolate chip ice cream that I made from Alton Brown’s chocolate ice cream recipe. Of course you could always use store bought ice cream, as well. 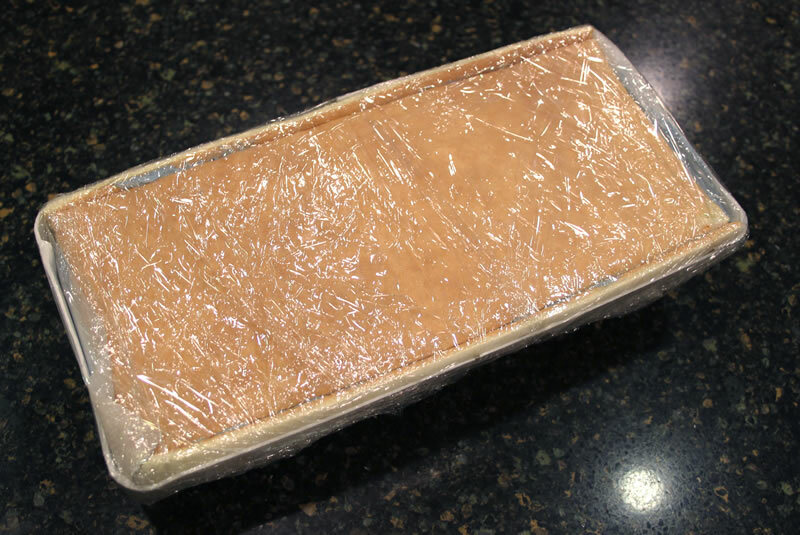 Just let it soften until it can easily be spread into the mold and then store the cake in the freezer. 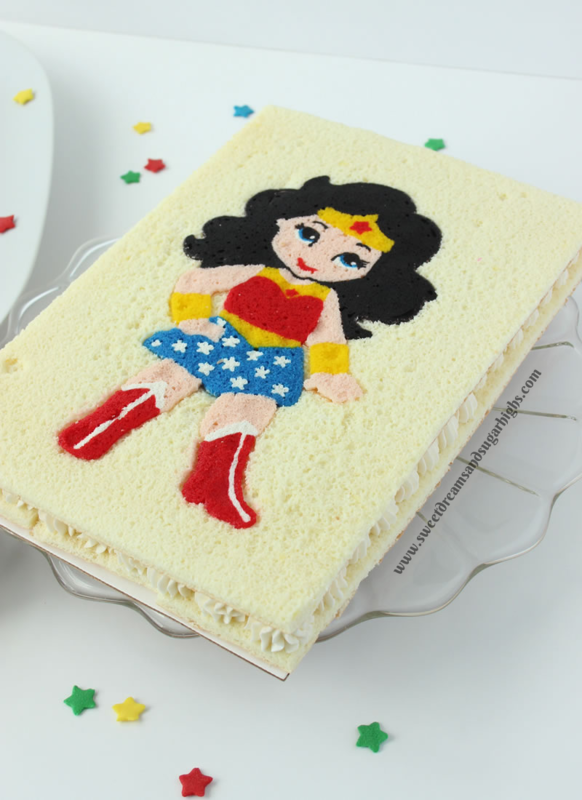 If you don’t want to do a rolled cake, you can just as easily leave your cake flat and add buttercream icing or whipped cream to the center like I did with this flat version of the Wonder Woman cake. That cake was originally supposed to be rolled but I had experimented with spraying cooking spray before adding the sponge batter and found that it caused the colored batter to separate from the sponge so I couldn’t roll it as it wouldn’t stick together. After that I stuck with only using parchment. I did get a little sticking here and there but not too bad at all. I found that greasing the sides of the pan helped the cake release much easier without having to tear the cake up when you run the knife along the side to release it. If anyone else has any better recommendations for how to keep the cake from sticking completely without causing the colored batter to smear or separate from the sponge batter then please let me know in the comments below. Overall though, parchment seems to work pretty good and the sticking was minimal as long as you carefully peeled it away. Bake a pound cake. 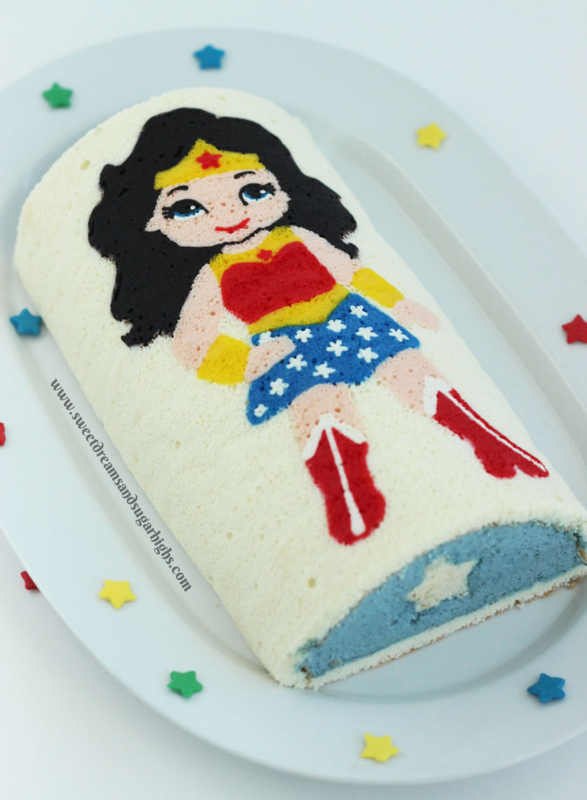 I made Chowhound’s Chocolate Pound Cake for the Weiner Dog cake and Grandmother’s Pound Cake for the Wonder Woman Cake. 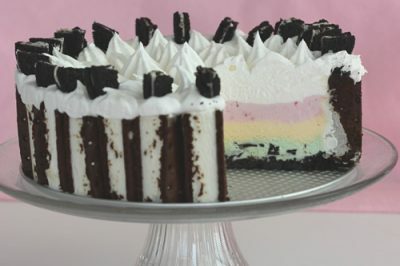 Once they are cooled, slice them into 1/2″ slices (or however thick your cookie cutter will allow) then use a small cookie cutter to cut out enough pieces that, when stacked, will be the length of your cake. 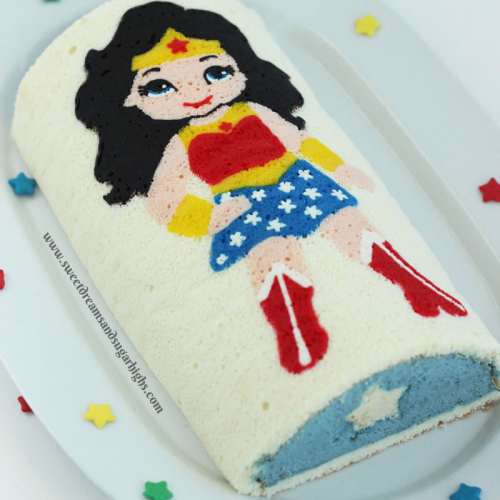 Press them together then wrap them in plastic wrap and freeze them until you fill the cake later. Moving on to the cake… because I didn’t want to make a full on Swiss roll with these cakes and wanted a thicker filling, I made myself a mold. They sell cake pans that are already shaped like this but I didn’t want to spend the money on one so I looked around the house to see what I could find. 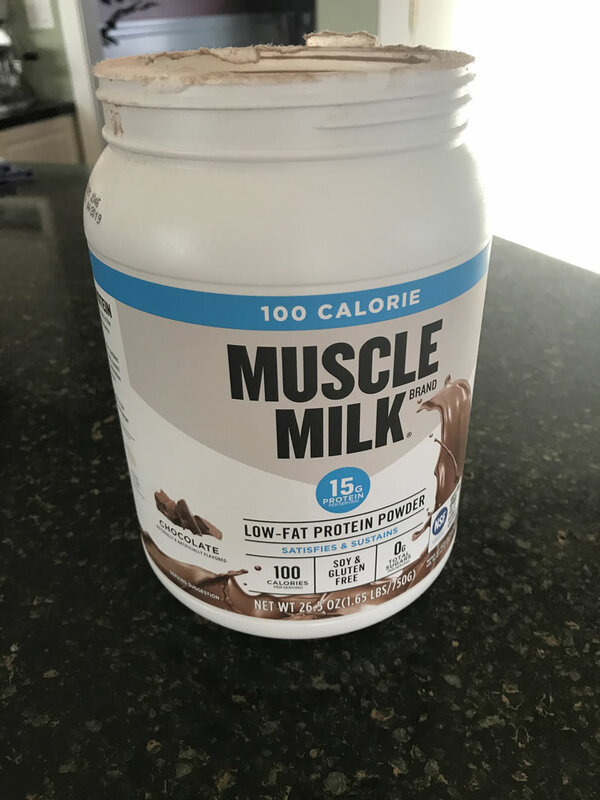 Turns out my Muscle Milk container was the perfect size. I removed the label and cut the top off with a utility knife (be VERY careful!!) then cut down the sides and through the middle of the bottom. 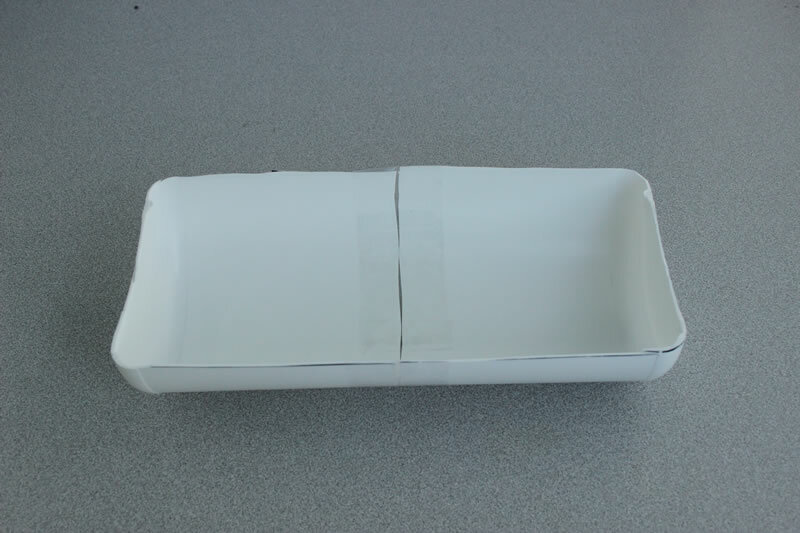 I then attached the two pieces together with packaging tape so that the bottom ends made up the ends of my mold. It worked perfectly! Plus it is easy to clean and can be used over and over again. Next I took measurements of the inside with a sewing tape measure and cut out a parchment piece the same size. For the ends, I laid the mold upright on the parchment and used a Sharpie marker to outline the ends and cut those pieces out as well. 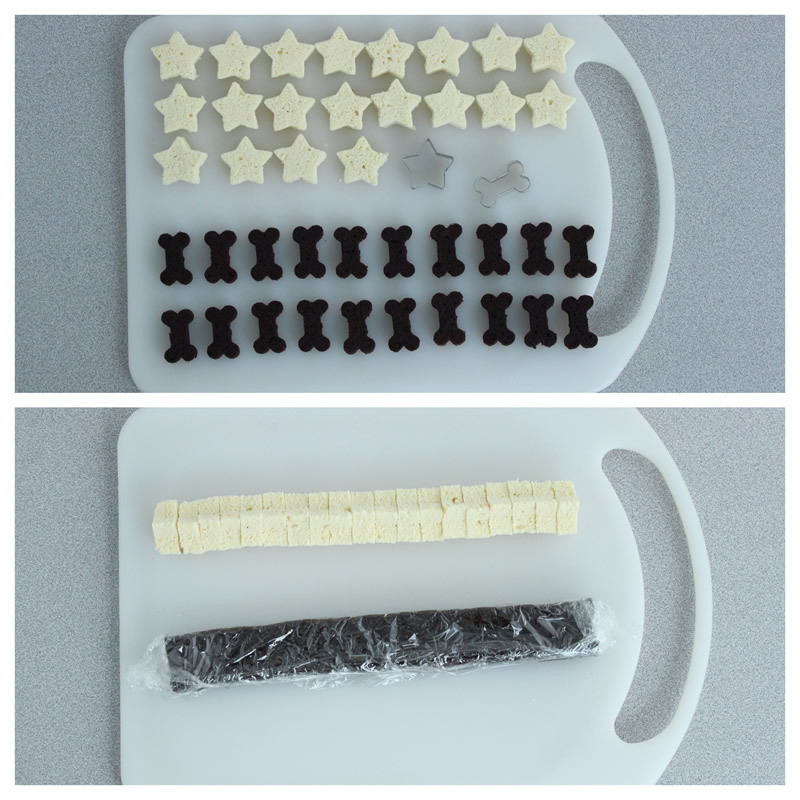 You will use these later to keep the cake from sticking in the mold so you can put them aside for now. I then cut a piece of parchment to fit my jelly roll pan. 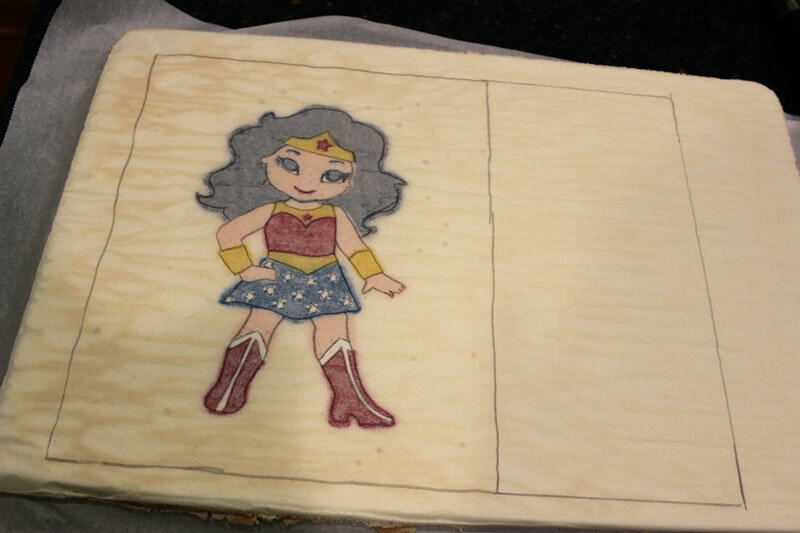 On this piece I drew out the dimensions of the inside of my mold as well as the height and width of the top of the mold so that I could make sure everything fit on the parchment. You will notice that I placed them more in the center of the parchment, not on the edges, so that I would have some room to cut off edges that might rip a little when being removed from the pan. I then transferred my image onto the center of the inside pattern. 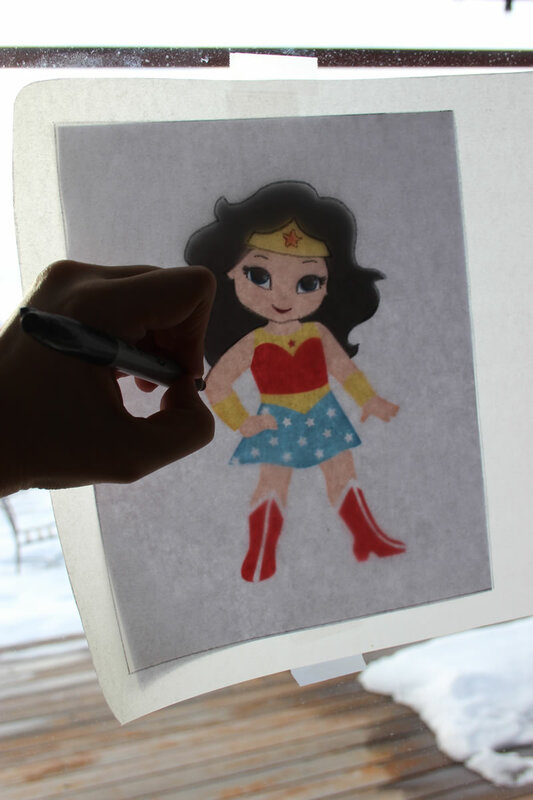 The easiest way to do this is print off a photo the size you want (there are lots of cute images online) and tape it to a window. Then tape your parchment over it and use a Sharpie marker to copy it onto the parchment. It is best to use a simple image as the more detail you have the more difficult it is to get all the detail in and you risk it looking sloppy. Here is what your parchment should look like after everything is drawn on it. Just for reference, my inside pattern measured 8 1/4″ x 10 1/4″ and my top piece pattern (the rectangle next to it) measured 4 1/4″ x 10 1/4″. This next step is VERY important!! 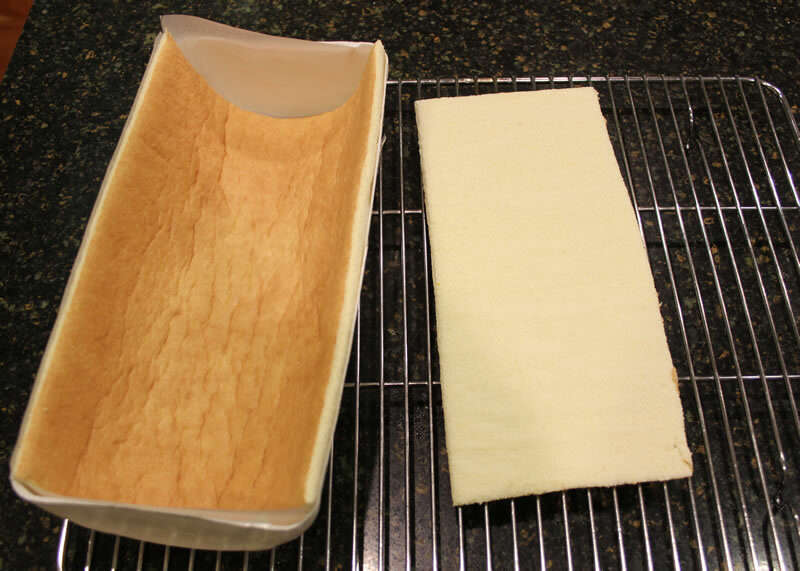 You want to make sure to flip your parchment UPSIDE DOWN onto your jelly roll pan. I repeat….. UPSIDE DOWN!!! If you don’t do this then the ink from the marker will transfer on to your cake. Now for the fun part! Mix up your colored pattern batter (see recipe below). 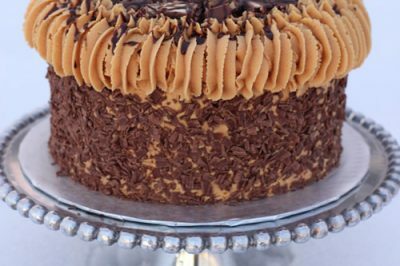 I have found that it is best to use the chocolate pattern batter for anything that is brown or black, that way you don’t have to add any additional color or just have to add a little bit of color, in the case of black. Place the batter into icing bags fitted with small round tips or in plastic sandwich bags and cut a tiny piece off the corner of the bag. 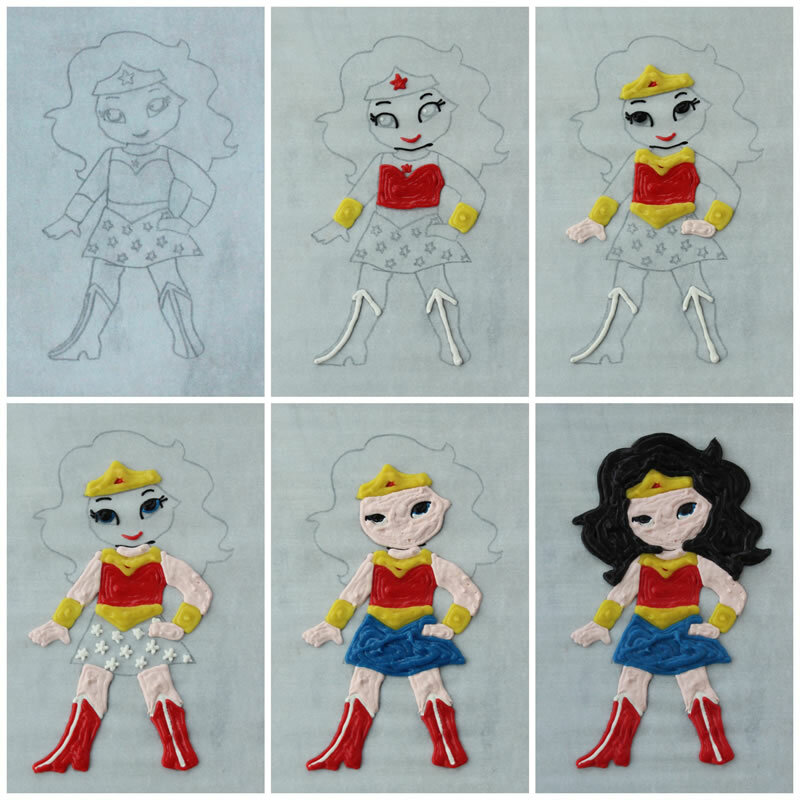 I like using the tips because I can switch them out and use really small tips, like #00 for small details and then larger tips, like #3 for larger spaces, like Wonder Woman’s hair. Once you have your colored patten complete, put it back in the freezer for an hour to firm up really well. Your oven needs to be hot, 450° F, so be sure to give it plenty of time to preheat. 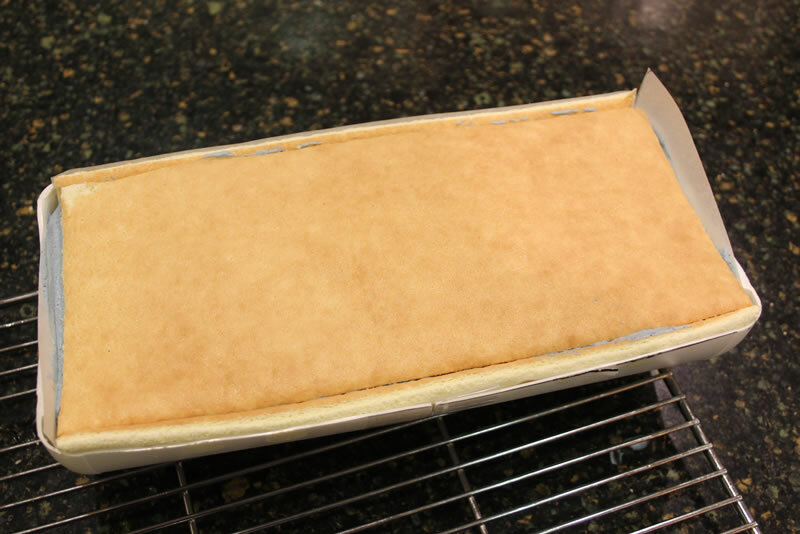 The sponge only bakes for 7 minutes so you want to make sure the temperature is correct from the start. After the hour of freezing time, remove your pan from the freezer and use some butter or shortening to grease the sides of it. This will help the cake release easier once it comes out of the oven. Now make your sponge batter (see recipe below) and pour it over the colored pattern. I found that it was helpful to cover the image first to make sure that I had plenty of batter covering it before adding batter to the rest of the pan. You can see in this picture that I put some of the batter in an icing bag with a large round tip and made sure the batter covered everything in my image first. Then I poured the remaining batter over the rest of the pan. This may not be a necessary step but it gave me a little more reassurance. Use an offset spatula to evenly spread the batter over the whole pan, right up to the sides. Then immediately place the cake in the oven for 7 minutes. Once it is done baking, while still hot, use a sharp knife and run it along the sides of the cake to release it from the pan. Now lay another piece of parchment over the cake and set another pan on top of that then flip them over. Remove the hot pan and the cake should easily drop onto the cold pan. Carefully remove the parchment by slowly lifting it from the cake. Use a pizza cutter and ruler to cut the cake to size. I used my first parchment pattern (remember those first ones I cut?) and laid that on the cake then laid the ruler on the edges. For the top piece you can just measure it out with the ruler or you can cut another parchment pattern to size, like I did. 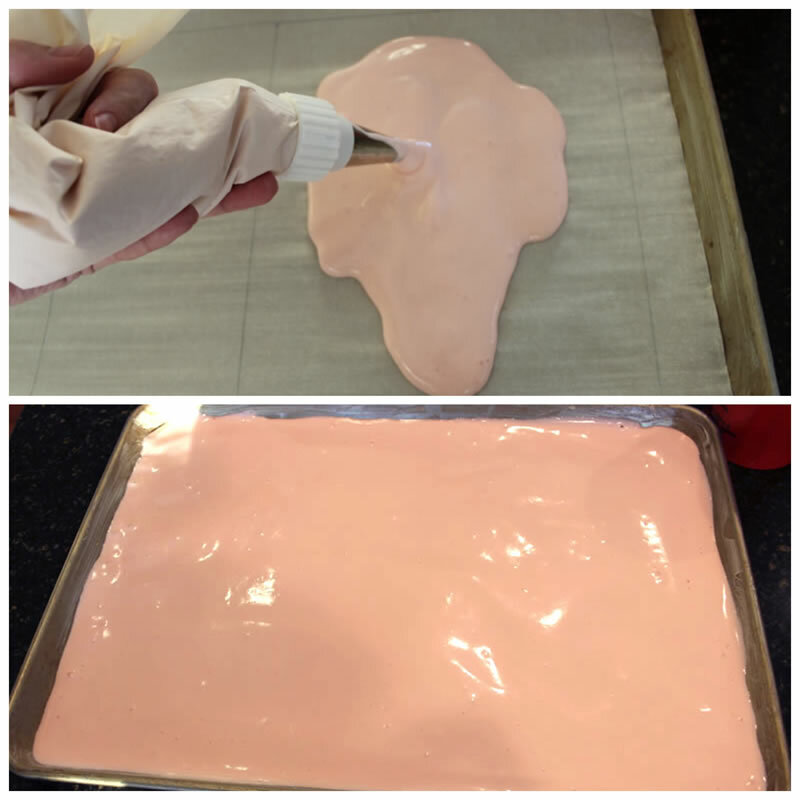 You want to place the inside parchment piece into the mold then flip the cake upside down and lay it down on top of the parchment in the mold. Then place the parchment end pieces on the ends, making sure they slide down the side of the cake. Let the cake cool completely while you make the filling. The top piece can just cool on its own for now. If you are doing a solid filling, like I did with the ice cream, you can scoop it all into the mold once the cake is completely cooled. 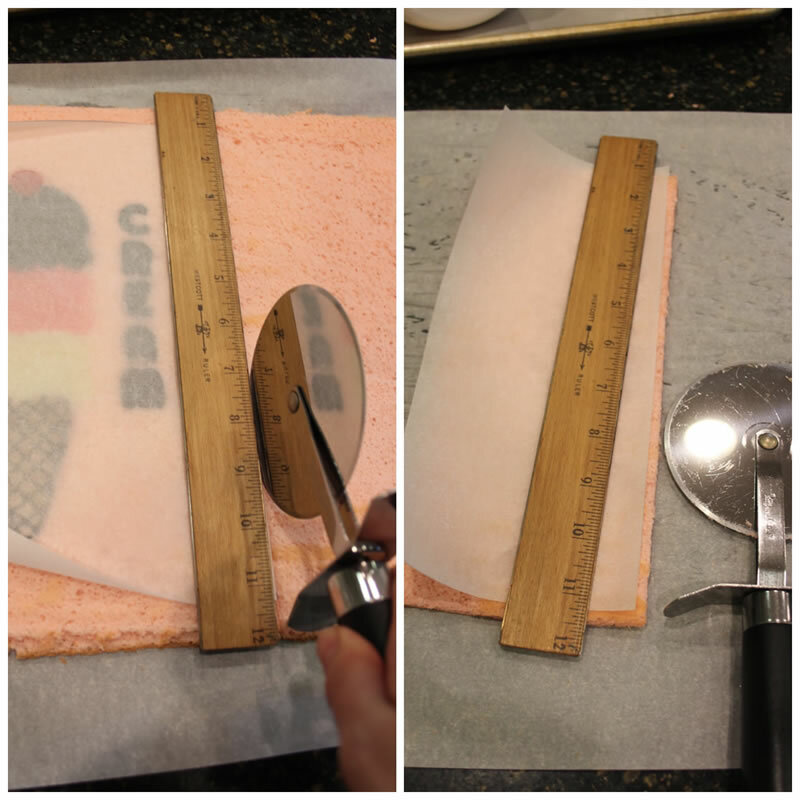 If you are using a center piece then you want to add your filling about 1/3 of the way up the mold then remove your cake pieces from the freezer and place them on top of the filling. 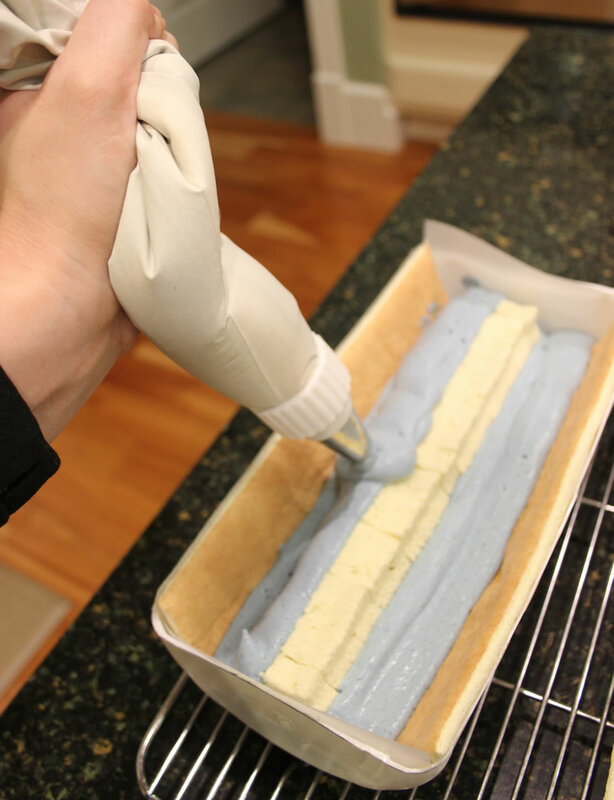 Continue adding the filling to completely cover the center piece and fill all the way to the top of the mold. I found it was easier to do this by placing the filling in an icing bag fitted with a large round tip. 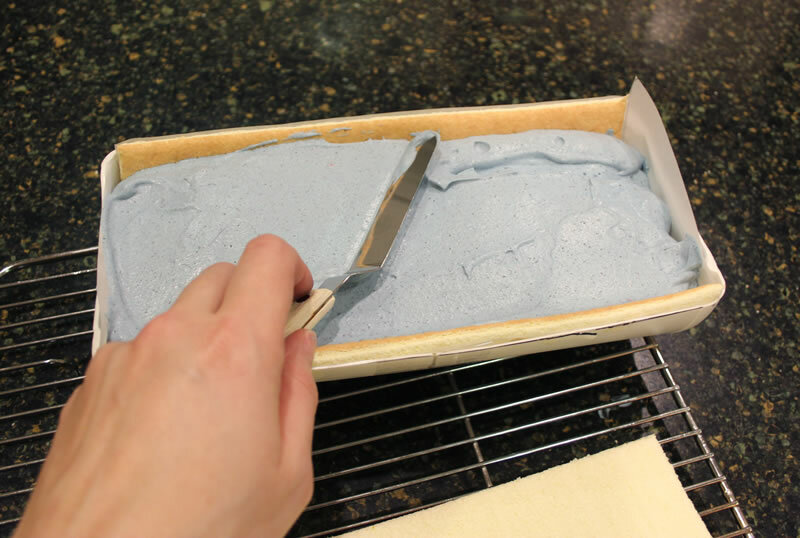 Once all the filling is in place, use an offset spatula to smooth it out. Leave enough room to place your top piece of cake on the filling so that it lays level with the sides of the cake. Now add the top piece on top of the filling. 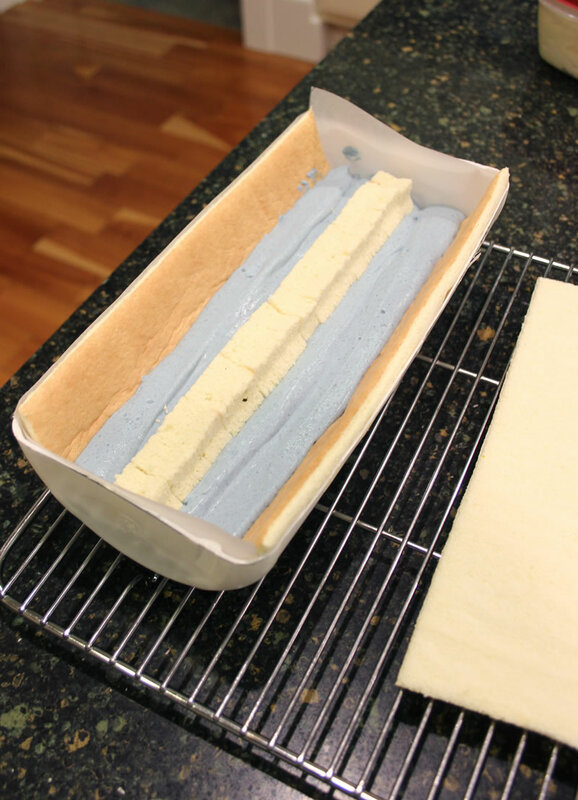 Wrap the entire mold tightly in plastic wrap and refrigerate overnight, or freeze in the case of an ice cream cake. 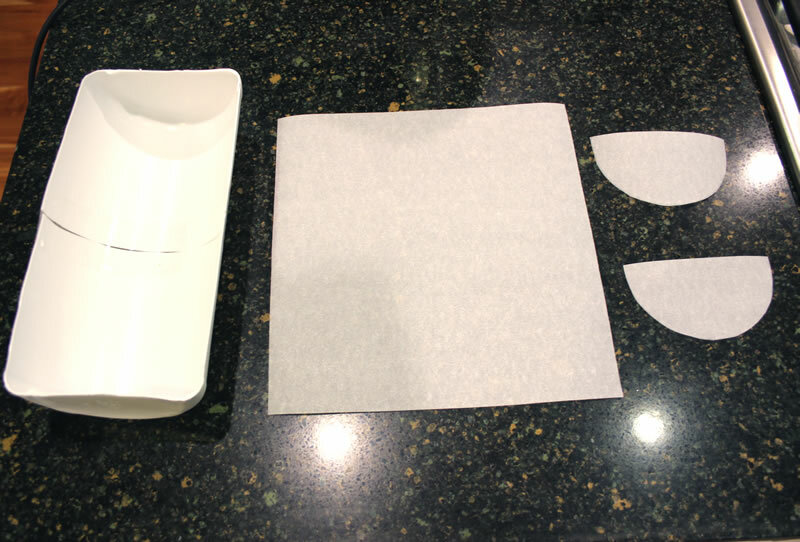 The next day, remove the plastic wrap and flip the cake onto your serving dish then remove the mold. 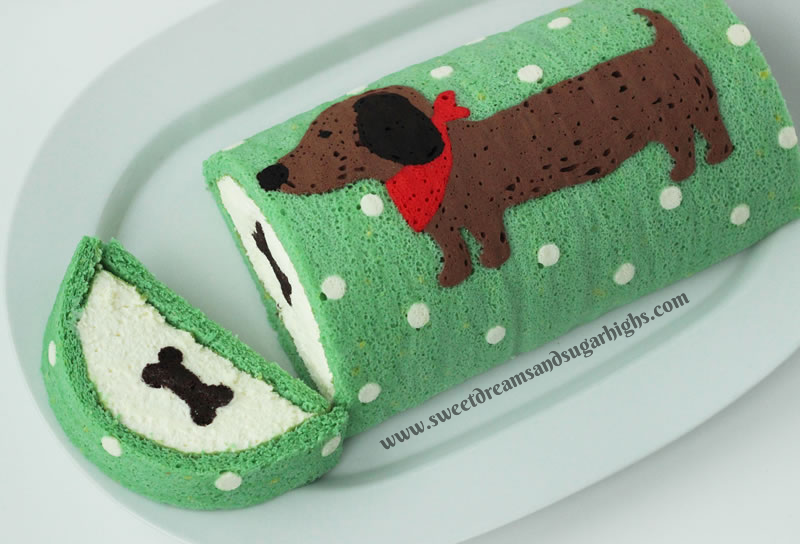 You should have an adorable decorative rolled cake! Good luck and I can’t wait to see the designs you come up with. I would love it if you shared them with me on my Facebook page or tagged me in them on Instagram. Wishing you Sweet Dreams and Sugar Highs! 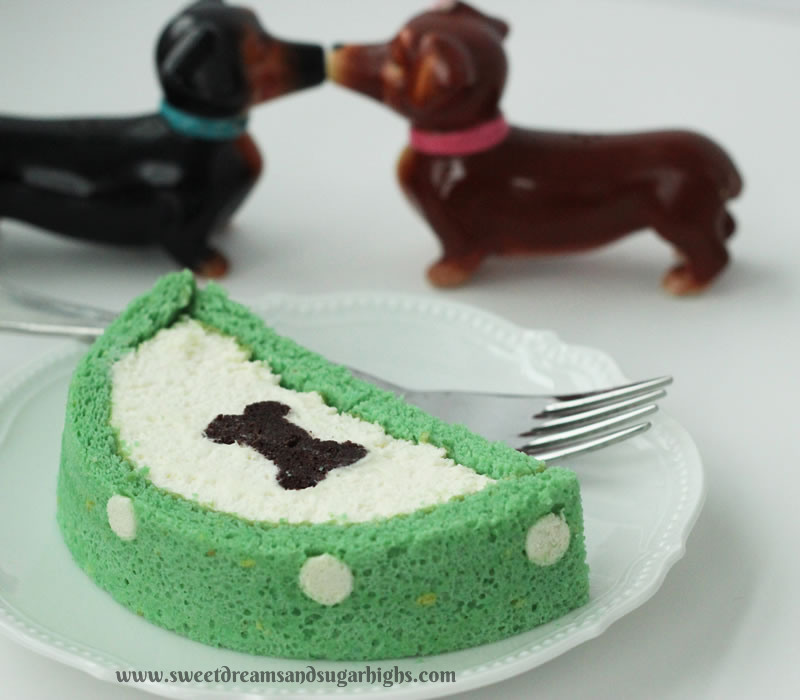 A sponge cake that uses colored batter to add a decorative flair. 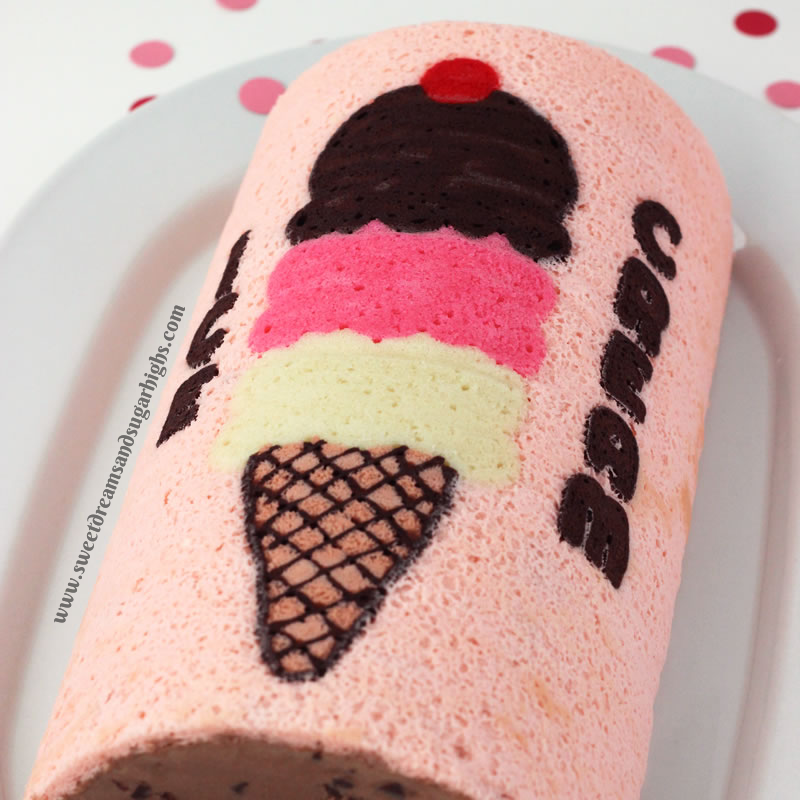 It can be filled with mousse, ice cream, whipped cream, or anything else you desire. The sponge batter recipe is adapted from Rose Leavy Beranbaum's "Biscuit Roulade" recipe in her book, The Cake Bible. Cream together butter and powdered sugar with an electric mixer until well combined. Add egg whites and beat well. Stir in flour (or flour and cocoa powder if making chocolate). Divide batter and color with food colors. Place batter in icing bags fitted with small round tips, or place in plastic sandwich bags and trim small end off corner. 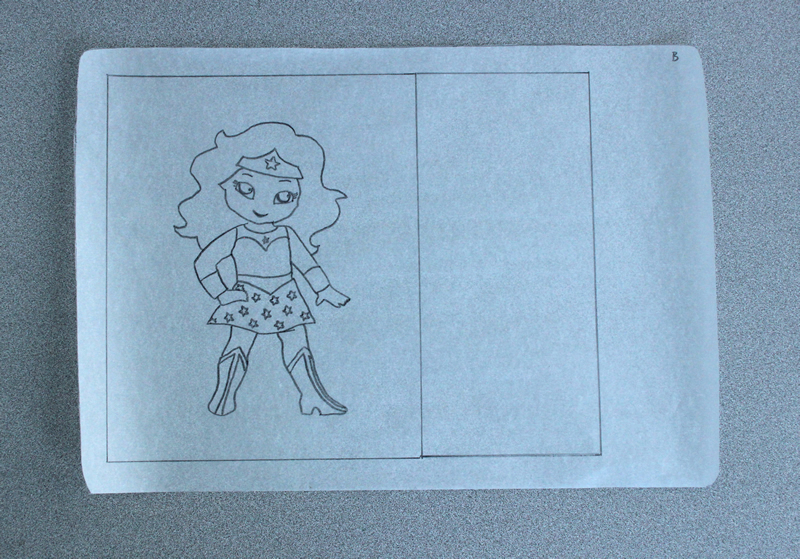 Draw image on parchment paper that is cut to size for a 17x12" jelly roll pan. Place parchment upside down on baking sheet and pipe colored/chocolate batter on image. Freeze for 10 minutes in between layers. 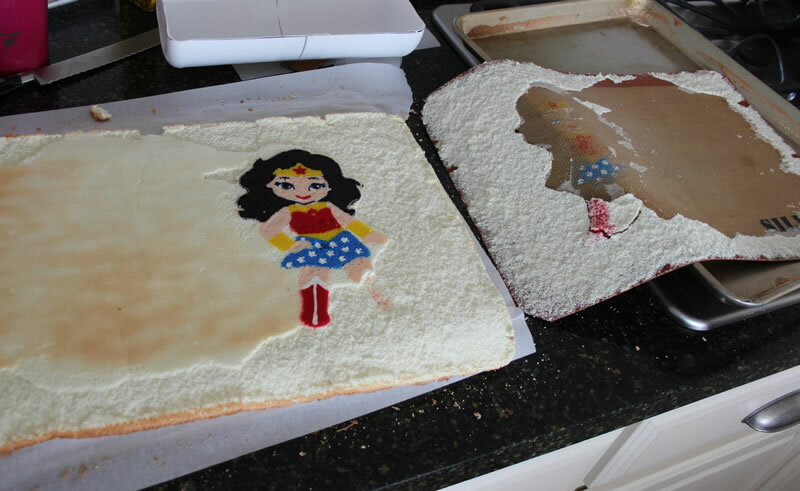 When image is complete, freeze for 1 hour before adding sponge batter. Preheat oven to 450° F. Whisk together cake flour and cornstarch. Sift through a sieve then set aside. Separate 2 of the eggs, placing the yolks in the bowl of a stand mixer fitted with a paddle attachment, and the whites in a different bowl. To the yolks, add the additional yolk, the 2 remaining eggs, 1/2 cup sugar and food coloring, if desired. Beat on high speed for 5 minutes until thick, fluffy and triple in volume. Beat in vanilla. Sift half of the flour mixture over the egg mixture and fold it in gently with a large whisk. Repeat with the remaining flour mixture. At this point, if you only have one mixer bowl, transfer the batter into a different bowl and wash out your mixer bowl very well so that no traces of grease remain. Transfer the egg whites into the grease-free mixing bowl and place in the stand mixer, fitted with a whisk attachment. Beat until foamy then add cream of tartar and beat until soft peaks form. Add the remaining 1 Tbsp of sugar and beat until stiff peaks form. Fold the whites into the batter. Remove the pan from the freezer and use butter or shortening to grease only the sides of the pan. 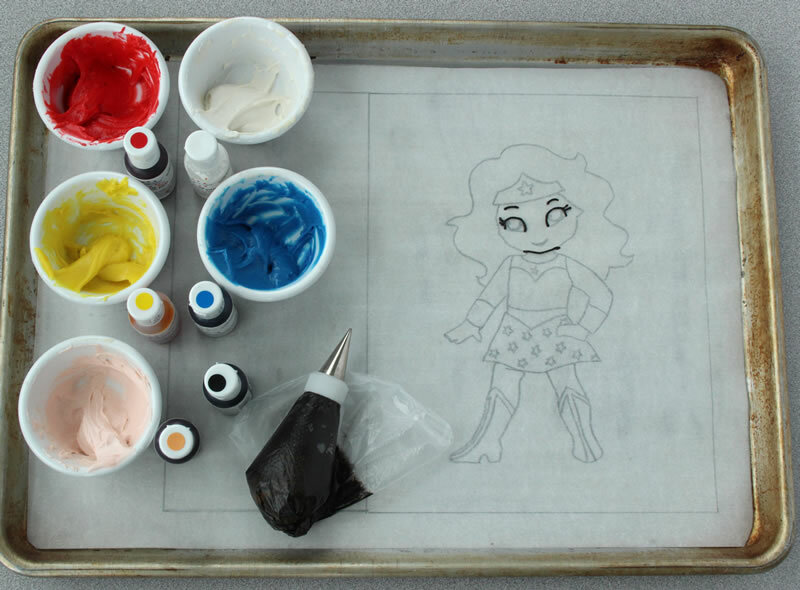 Begin by carefully pouring batter over the colored image, then pouring it over the rest of the pan. Use an offset spatula to carefully spread the batter, being extra careful around the image so you don't smear the colored batter. Tap the pan on the counter a few times to remove some of the air bubbles. Bake in preheated oven for 7 minutes, or until golden brown and springy to the touch. Immediately loosen the edges from the sides of the pan with a sharp knife. Lay another piece of parchment paper over the cake and lay another pan on top of the cake then flip it over and remove the hot pan. 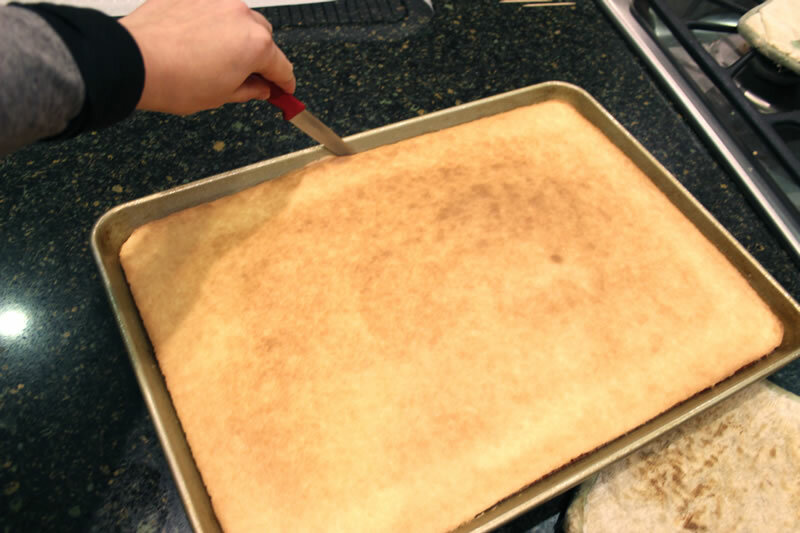 Carefully lift the parchment off of the cake. You can either use the cake as a Swiss roll, or cut it to the desired size and use it flat, or form it in a mold like I did. Refer to the tutorial for instructions on forming it in a mold. Be sure to roll it or form it while still warm but allow to completely cool before adding a filling.